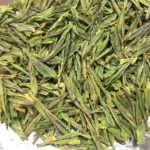 We are releasing two types of Pre-Qingming Long Jing. 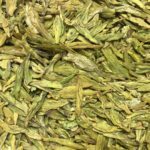 The yellowish one is Xihu Long Jing,classic quality with frying flavor of LongJing, full-bodied taste! The greenish one is so-called Tu Long Jing, by traditional mixed tea cultivar, very flowery flavor and very sweet taste. Both of them are made by very ideal material, and art level processing. Fantastic quality!